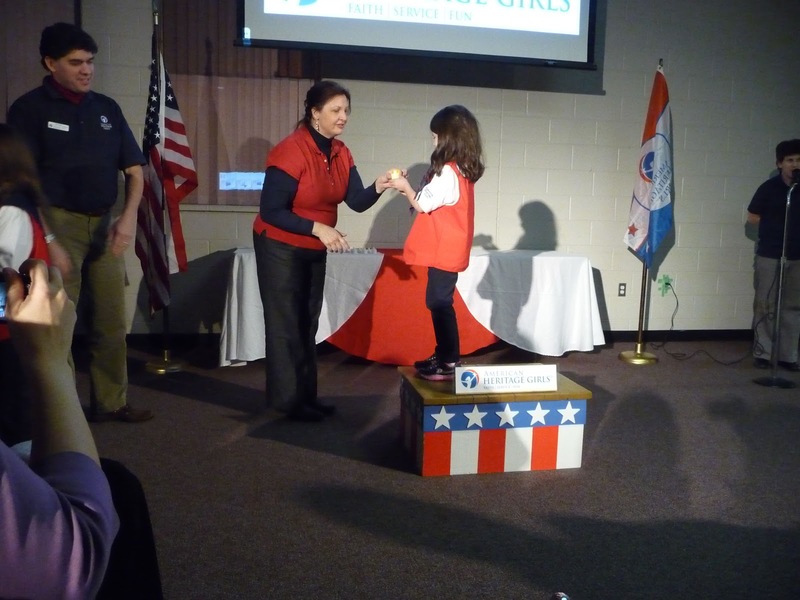 Our American Heritage Girls troop is new, so last Sunday they held their Joining Award ceremony and their first Badge Award Ceremony at the same time. 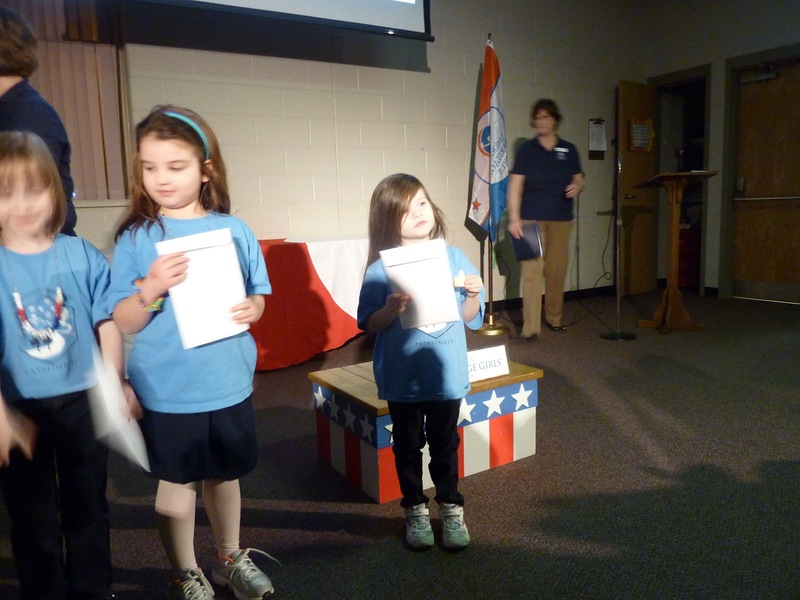 The Joining Award is given to each new girl for learning some basics, such as the AHG Oath and Creed, the Pledge of Allegiance, participating in the color guard, etc. and joining the troop. Since it is a new troop, all the girls received this. 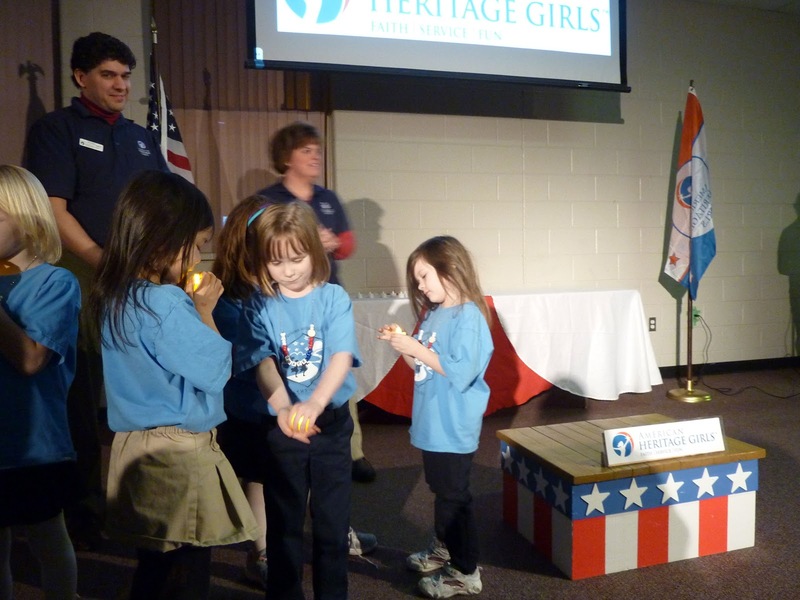 Each girl receives a lit candle (battery operated in this case to avoid hazards) to represent the light they are to carry in their hearts and into the world. 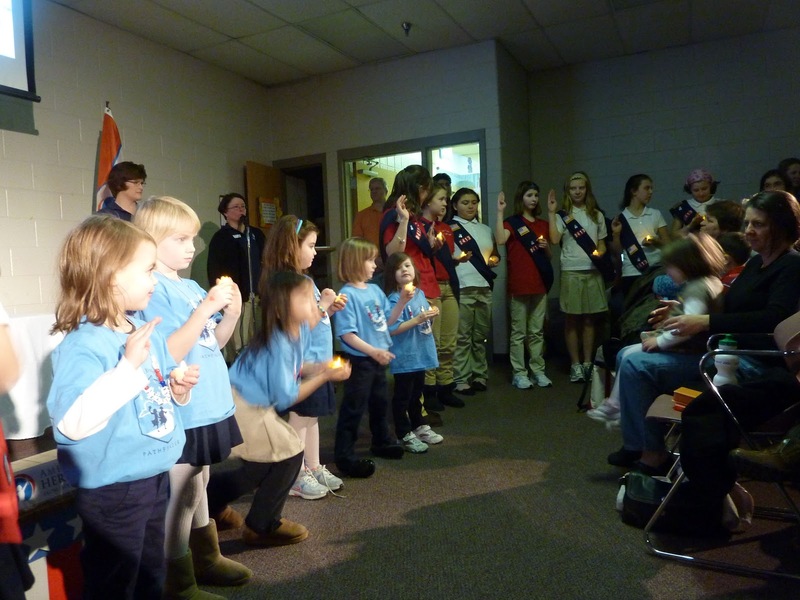 Then all the girls sang "This Little Light of Mine" lead by the youngest group, the Pathfinders. Felicity is the farthest Pathfinder, the ones in blue. 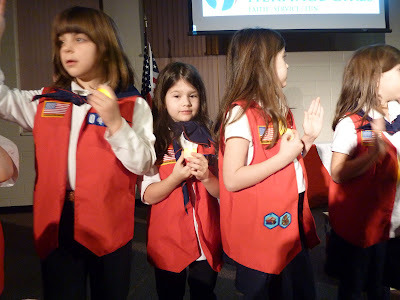 Then the girls were awarded any badges they had earned. Pathfinders earn beads for their necklaces but Felicity did earn a beautiful (and insanely large!) Joyful Mysteries badge that I'll save and sew onto her vest in the summer when she moves up to the Tenderhearts. 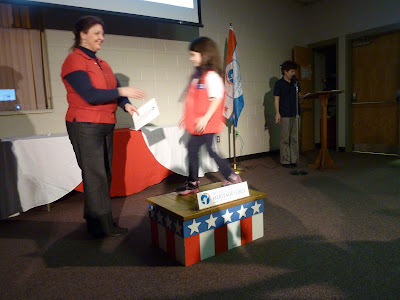 Cecilia earned her Our Flag, Daughter of the King, Puppetry and Kid Care badges. There will be a second Badge Ceremony in June at the end of the year for any other badges they earn. Since the ceremony, Elizabeth has been begging to become an American Heritage Girl. We told her she has to be five years old to join. 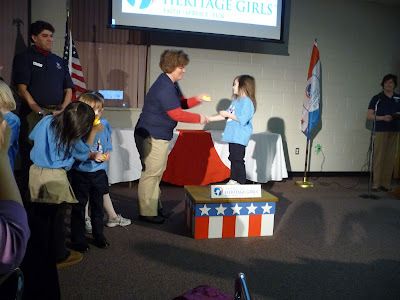 So she has been repeating to me multiple times a day all week that she is going to turn five and be an American Heritage Girl. Unfortunately I discovered today that she was planning on skipping turning 4 and just turn 5 in June. I had to explain it doesn't work that way. She has to turn 4 before she turns 5. 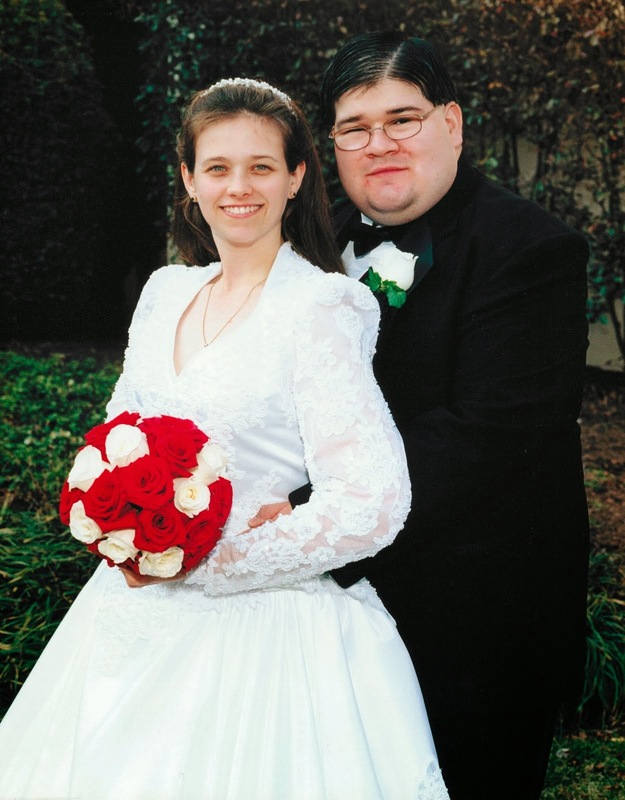 She whined, "But that'll take a long time." I don't think there is much I can do about that, but she is definitely very eager to sign up!